It’s time for dinner on a depressingly rainy, Daylight Saving Time night and she sets out a can of tomatoes, sprouted wheat bread, and cheddar cheese and mixes up a box of Ghirardelli brownies. He takes one look at the plan and wants to make tacos instead. They’re both strong-willed and come armed with plenty of ideas, but somewhat willing to come to an agreement. What’s the mean distance between a taco and a grilled cheese? A Taco Grilled Cheese, of course! A delicious compromise. This is so easy that there’s no need for a recipe. 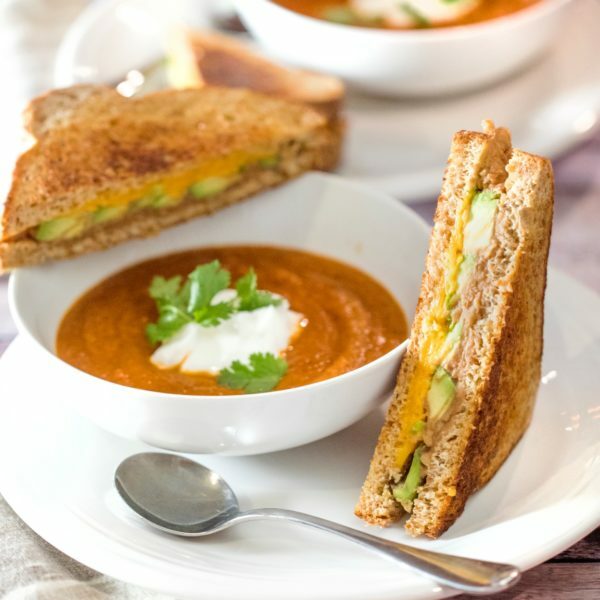 Make a grilled cheese like you know how to do, and just add a sliced avocado, spread on some refried beans from a can, sprinkle lots of shredded cheddar, and some sliced green onion. For bonus points, add a minced chipotle pepper to your tomato soup and top it with some sour cream and cilantro. After dinner, eat the brownies right out of the pan you cooked them in. Something chocolate-y and something cheesy instantly seem to make a rainy, subpar day so much better.